The Tiny Skillet: Taigating Time & Thunder by the Bay! Taigating Time & Thunder by the Bay! Time for the playoffs and Tailgating Time week # 19 - The the play offs continue, and so does good food, and a pitcher full of cold ones! Everyone is getting ready with some great ideas for The Super Bowl! Bring over your famous recipes for you favorite foods and party things! We always appreciate our loyal friends who join us each week, and welcome those of you who are new to us!! Come on and have some fun! it's easy, just add your recipe to the linky. Everyone brings their bike to show them off, and check out other bikes. This event draws more than 30,000 people and I don't know how many bikes. I love this shot with all these Harleys parked out front of the opera house. It was funny seeing bikers in full biker dress walking out of Starbucks with their lattes in hand (I didn't have my camera ready for that). Many streets were blocked to cars, but bikers could come in to park it. Many came in the leathers and biker gear to show that off as well. Some probably dress like that year round while others drag it out from the back of their closets and dust if off just for events like this. I didn't dress the part though, I looked more like a beach girl, but then my husband won't ride a Harley. He has a vintage bike that he restored and it is eligible for an "antique" tag this year! I can't believe this man slept though all the noise and hubbub! Zzzzzzzzz, must of been a boring bike show. Now to the food...they actually had a hog roasting on a spit...and not the bike kind of hog! quick, snap, I got one.... tropical hut with burgers...emu burger anyone? no, how about a buffalo burger? ...or lemonade with a fresh lemon? 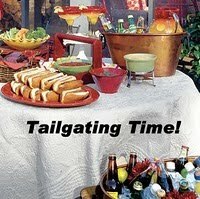 Now back to tailgating time, have fun!! I am in awe! All looks like so much fun. And I'm drooling over the chocolate trifle! Looks like a good time! Thanks for hosting Lyndsey. Sounds like you had fun! The sweet potatoes choco chip muffins sound interesting. What a bike show! Or more like, food show! lol. I especially love the sliders.. mm. Very hard to get those on menu here in Montreal. All the link recipes look so good up there! Yumm..
Looks like everyone was having fun. We visited with a biker that was on his way to Sarasota from Fort Myers. Bet he had fun too. The bike show looks like a ton of fun. Especially, if you got to have some of those potatoes and kettle corn. Thanks everyone who took the time to stop by and enjoy the food (and bikes). I have to add mine yet...yikes! What should I bring? This so reminds me of Blues, Bikes and Barbeque in northwest Arkansas! It's always soooooo loud but soooo much fun! Loved your post.